BICC Publications/Establishing a Mining Sector in Postwar South Sudan. You are here: Home » Publications » Establishing a Mining Sector in Postwar South Sudan. 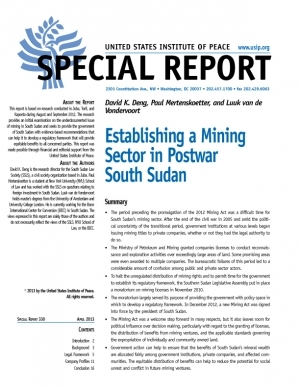 Establishing a Mining Sector in Postwar South Sudan. This report is based on research conducted in Juba, Torit, and Kapoeta during August and September 2012. The research provides an initial examination on the underdocumented issue of mining in South Sudan and seeks to provide the government of South Sudan with evidence-based recommendations that can help it to develop a regulatory framework that will provide equitable benefits to all concerned parties. This report was made possible through financial and editorial support from the United States Institute of Peace.